Devon Graham began his career as a broad-based naturalist with a B.S. in zoology at Andrews University in Michigan, spent two years working on agricultural projects with the Peace Corps in Niger, Africa, obtained a masters in biology at Walla Walla College and a Ph.D. in biology at the University of Miami. 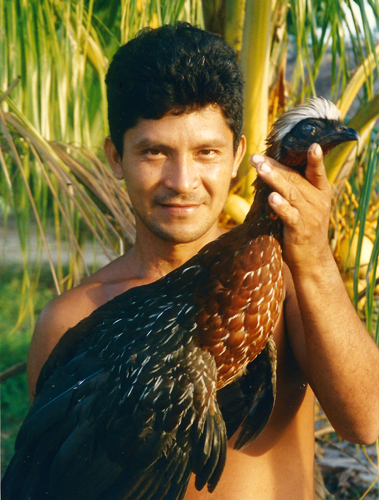 He is President of both Project Amazonas, an NGO which conducts ecological research at four field stations and provides humanitarian assistance to native and campesino communities in the region and its partner company Margarita Tours which offers special ecotours in the northern Peruvian Amazon. Dr. Graham also teaches field courses about the Amazon and the Everglades in the Honors College at Florida International University and has done extensive consulting and teaching with other educational institutions, zoos, aquariums, and environmental firms. CACE Executive Director Campbell Plowden often meets up with Devon at their favorite hangouts in Iquitos during their visits to Peru. He and other Project Amazonas associates have been very supportive of CACE’s efforts to develop and market handicrafts made by native communities in the region. Plowden asked Dr. Graham about his work in November, 2012. CP: What got you first interested about working in the Amazon? DG: From the time I was a kid I was fascinated by Amazon stories, but never dreamed that I would ever have a chance to go there – it seemed so remote! Then in graduate school, a mutual friend put me in contact with the founder of Project Amazonas, who invited me to come down and do an assessment of the biological field station that the organization was setting up – so in September, 1994, I flew from Miami to Iquitos – a 3 1/2 hour flight (not so remote! ), and just kept going back again and again afterward. 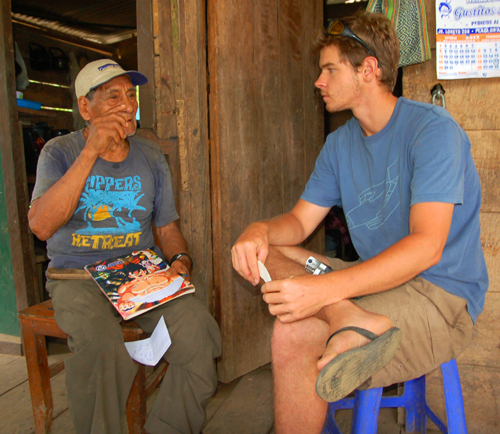 CP: What experiences led you to join Margarita Tours and Project Amazonas? DG: Project Amazonas was founded by the original owners of Margarita Tours and former clients of theirs. They wanted to give something back to the Amazon, and this was their way of doing it. I worked for Margarita Tours for a number of years, learning all the ropes, before assuming ownership in 2004. 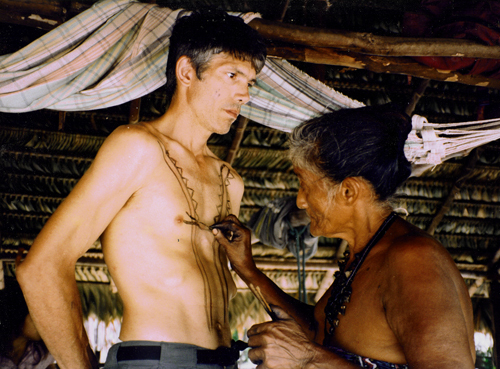 At the same time I was dovetailing-in work for Project Amazonas, and was voted president of the organization in 2000. In reality, the proceeds from ecotour trips by Margarita Tours is a large part of what allowed the expansion of Project Amazonas in its early years, and it still funds my travel back and forth to the Amazon. CP: How do you view the opportunities and risks of ecotourism for Amazon conservation and communities? DG: Ecotourism can be a very positive thing for the Amazon and its natural environment and communities if handled right. From the start, we have made a concerted effort to involve the local people and communities at every level – all of our employees are Peruvian, for starters, and virtually all of our proceeds also stay in Peru, and are re-invested into conservation, medical and educational work there. It also helps to be selective in the types of ecotours that are offered. We only host relatively small groups of ecotourists, as well as several school groups annually, so our footprint is small. Likewise, our clients are people who are truly interested in the Amazon and who expect to have interaction with the local people, and also expect to get muddy and sweaty in their explorations of the Amazon. No armchair tourists collecting another destination to brag about back home. Our clients like the synergism between Margarita Tours and Project Amazonas, and many of them become contributors to Project Amazonas. We also have a lot of repeat clients – the record to date is 10 trips by one of them! CP: What have been a few of the best achievements and biggest challenges for Project Amazonas to connect its NGO work to the Peruvian Ministry of Health? DG: We conducted our first medical service trip in 1998, and have offered them annually since then. In the early years, funding was the big block to conducting more trips. In the last couple of years in particular, however, interest in participation on trips has skyrocketed, and we have 8 two-week trips scheduled for 2013. A couple of them are already at or near capacity. The Peruvian Ministry of Health has been very supportive of the trips. Peruvian medical personnel are very well trained by any standard, but the Ministry of Health simply doesn’t have the budget to be able to regularly reach the thousands of small communities scattered along tens of thousands of miles of riverbank in the region. With our boats, we bring some of that logistical capacity to play, and we also provide much of the medications that local people might not otherwise be able to afford. Generally one or more medical staff from the largest health center in the area to which we are travelling accompanies the boat, as does a doctor and dentist from Iquitos (and additional medical volunteers, of course). The local medical personnel know the communities and use the boat as a base for vaccination, malaria prevention, and education campaigns, while the other medical personnel take care of the immediate needs of the residents. CP: What do you consider the most interesting research project that has been or is being conducted at any of your field stations? DG: There are so many interesting puzzles to work out in the Amazon that it is hard to say! Two of my favorites (I can’t just pick one!) are “Devil’s Gardens” and a complex story involving cucumbers, flies and wasps. Dr. Megan Frederickson (who is now an Ecology professor at the University of Toronto) was a graduate student at Stanford when she studied stands of an understory tree – Duroia hirsuta – which forms an association with ants that live in swellings in the twigs. The ants kill off competing vegetation, leading to the “devil’s gardens” where virtually nothing, other than the Duroia trees, grow. By looking at growth rates and sizes of hundreds of trees in many different gardens, she was able to determine that some of these gardens may be very old – one large one at the Madre Selva field station was estimated to be about 800 years old. Just this year, Dr. Marty Condon (Cornell College, Iowa) and colleagues studied wild cucumber species that have separate male and female flowers, which are parasitized by different species of fruit flies, which in turn are parasitized by various species of tiny wasps. Both systems are fascinatingly complex, and since I like puzzles, they grab my attention! CP: What do you think is the value of the work that the Center for Amazon Community Ecology is doing in Peru? DG: Empowering local people in the Amazon to sustainably maintain their environment while providing them with the opportunity to make a decent living and better their futures is essential if we hope to have a functioning Amazon in the future. What CACE is doing needs to be replicated a 100 times! There are a lot of valuable skills that the CACE projects are encouraging – resource management, quality control, marketing, social and political organization skills – all of these are really going to be critical for local people as they take more direct control of their lives and futures. CP: How do you find balance in your life being a teacher, running a business and directing an NGO? DG: Balance? Since no sleep or extending the numbers of hours in a day aren’t options, I guess the balance comes from realizing that I can’t do everything, and learning to be OK with that. I’ve started to try to delegate more as well, though that is hard to do! Balance is something that I’m still working on! If someone out there has the solution, let me know! 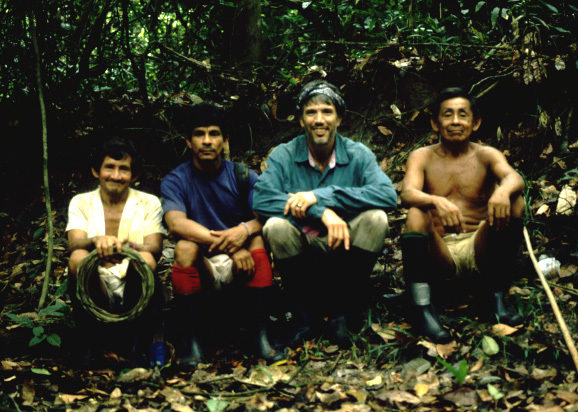 For the past three years, the Center for Amazon Community Ecology has been working with the Bora native community of Brillo Nuevo to measure the abundance of copal trees in their forests and evaluate the quantity and quality of aromatic essential oil that could be produced from its sustainably harvested resin. We are now also exploring the rosewood tree (Aniba roseaodora) and a few of its relatives as new sources for community production of fragrant oils. Rosewood grows in wild in Brazil and almost every other country in the Amazon region. It has been used for centuries as a source of oil for perfumes and wood for making fine furniture. Unfortunately the whole tree was routinely harvested to make these products. Severe rosewood exploitation led to concerns about its possible extinction and eventual restrictions on international trade in the species through Appendix II of the Convention on International Trade in Endangered Species (CITES). The Brazilian government also passed national legislation to protect the species domestically. CACE is now developing a project to produce a sustainable supply of rosewood oil by distilling its leaves and small branches and planting a new generation of rosewood trees in secondary forests at Brillo Nuevo. We had never encountered rosewood in any of our forest surveys around Brillo Nuevo, but our former local coordinator Oscar told us in late June that he could lead us to one “palo de rosa” tree where we collect enough material to distill a test batch of oil. Oscar’s parents brought several rosewood seedlings with them when they moved from the Rio Algodon to the Ampiyacu River region around 1945. One of the trees they planted in front of their house survived and filled the air with a memorable pleasant aroma. When Oscar and his family moved from Ancon Colonia to the larger village of Brillo Nuevo so his children could attend school, it was understood he retained rights to the tall rosewood at the old site. Our five-person team piled into Oscar’s “peque-peque” (motorized wooden canoe) and headed an hour up the Yaguasyacu River to a small clearing just past past Ancon Colonia. We hiked through the forest and crossed slippery log bridges for about 20 minutes until Oscar found his old homestead and the sixty-five year old legacy rosewood tree. After two failed attempts to climb the tree itself, one team member scooted up a neighboring tree with our claw-like climbing spikes and snipped off seven one-inch thick branches with a pruning saw attached to a long aluminum pole. We weighed the leaves that drifted down to ensure we had at least five kilograms for our first trial. Later that afternoon we got a bag of leaves from a few species of copal and “moena” trees – relatives of the rosewood for other distillation tests. The next day our task was to extract as much oil from rosewood and other kinds of leaves we had collected. We set up our copper alembique pot and other parts of our distillation apparatus in the open kitchen area of the school. We shredded rosewood leaves and finely chopped the branches, stuffed them into the top of the vessel, filled it with water, and sealed the onion dome with caulking. After burning the plastic face off the thermometer in our first trial using firewood (instead of a gas stove), we shielded the lower part of the still with a few pieces of “calamina” (corruguated aluminum used for roofing). An hour after the fire resumed, an amber-colored oil starting dripping into the separatory flask. We measured the weight of oil that came out every half-hour until the process ran its course in four hours. The amount was less than hoped for, but it had an exquisite aroma. It was not hard to see why rosewood oil has been a classic scent for millennia. A specialty fragrance company President in Los Angeles later confirmed that we had distilled a promising product. This was a good step forward, but we knew that we couldn’t produce enough oil from one lone rosewood tree to establish a community enterprise. We could, however, plant some more to expand our supply of raw material for making oil and assist the recovery of a valuable endangered Amazon tree. The Marjorie Grant Whiting Center had given CACE two grants to support our Ampiyacu project and also funded an NGO called Camino Verde that did reforestation projects and documented traditional plant uses in the southern Peruvian Amazon. MGWC introduced Robin van Loon, its Executive Director to us and then funded a CACE/Camino Verde pilot project to sustainably harvest and develop several non-timber forest products in both of our areas. A key element of this joint project involves planting about 1000 rosewood seedlings at Brillo Nuevo. To start this process, we commissioned the Institute for Investigations of the Peruvian Amazon (IIAP) to produce the seedlings in their nursery at their research station in Jenaro Herrera – the same site as our long-term copal research. During my visit to this station in early July, the manager showed me the seedlings that would hopefully become the founders of a rosewood population in the Ampiyacu. They began by laying cuttings from a few small trees onto a planting bed that would be transferred to individual planting bags once they had a good root. We expect these will be large enough by late January for Robin van Loon, the Executive Director of Camino Verde to bring them to Brillo Nuevo for planting. The community had enthusiastically approved this project and chose five families by lots to plant and care for about 200 young rosewood trees in fertile “purma” – a patch of secondary forest in the fallow phase of a slash and burn growing cycle. We expect these trees will grow enough in three to four years to sustain a modest harvest of leaves that can be distilled into marketable rosewood oil. When I learned that a group of campesinos at Tamshiyacu had already planted several thousand rosewood trees and had experimented distilling some oil from their leaves, Yully Rojas (our Ampiyacu Project Manager) and I took the one hour “rapido” (fast motorboat) there with hopes of finding someone who could tell us about this operation. We eventually found our way to the house of Sr. Juan Silvano who shared the story of his group’s venture with rosewood that began about ten years ago. Tamshiyacu was known as a place where this aromatic tree had once thrived and been a center for rosewood exploitation and oil production. With encouragement and some technical assistance from IIAP, ten residents formed a group that collected and germinated seeds from a few remnant trees and planted about 7,000 seedlings in their properties. In meantime they collected enough leaves from some older trees to produce one liter of oil. They gave this batch to IIAP and the university to analyze, but never got any results. Juan then invited us to visit the area where he had planted most of his rosewood seedlings, some food crops and built a bunkhouse and lodge to host ayuhuasca ceremonies. He also carved hunks of tawari and palo sangre wood into jaguars, snakes, eagles, and abstract human figures inspired by shamanic visions for sale to his clients and other tourists. We paused to chat around a few of the rosewood saplings he had planted in 2003. The ones planted in open sun had grown very well. He had pruned them according to IIAP recommendations for several years so they wouldn’t grow taller than four meters – a nice height to keep the top leaves and branches within easy reach for harvesting. IIAP dropped its support for the project for some years and then renewed it temporarily in 2008 when it surveyed the abundance of seed trees and condition of the five-year old seedlings in the fields of the group members that hadn’t abandoned the project. The group renewed the registration of its group (the Tamshiyacu Campesino Association of Amazon Aromas) with the regional government, but they let this expire again when the government failed to offer any concrete way for them to make or sell any rosewood oil. The group’s most recent hope to use this resource came two years ago when a French woman came to the area to make fragrant essential oils with a high capacity distillation apparatus. She had bought batches of 300 kg. of leaves and branches from the five remaining active members of the association for a year, but their collaboration fell apart when they failed to reach an agreement on payment terms. After this venture failed, even Juan stopped maintaining his young rosewood trees and top branches now exceeded six meters. He could still start to manage them again, but he is content to let them grow into large trees if he can’t profitably harvest the leaves to make oil. Yully and I left Tamshiyacu knowing that Juan would be a valuable advisor for our rosewood oil project at Brillo Nuevo so we are now exploring ways to work with him and his group to get a hard start on learning the finer points of distilling rosewood leaves and find the best ways to market its oil. 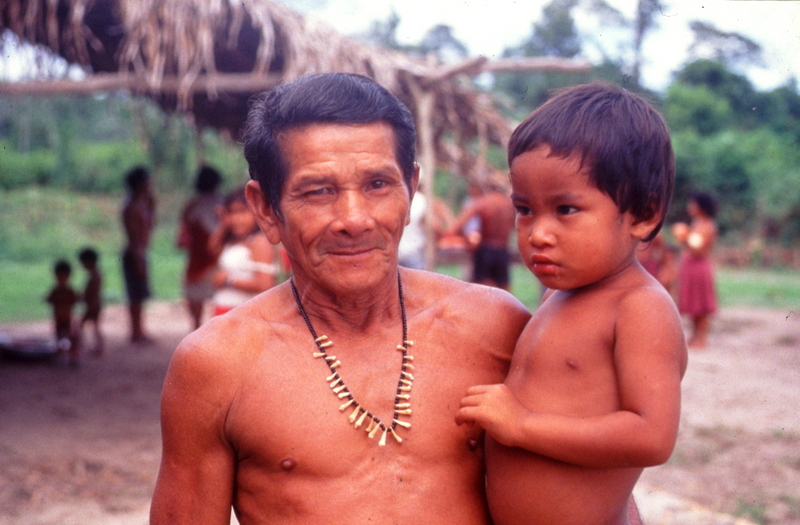 The Center for Amazon Community Ecology (CACE) was founded in 2006 to promote the understanding, conservation and sustainable development of human and other biological communities in the Amazon region. We conduct research on the ecology and sustainable harvest of non-timber forest products (NTFPs) and work with forest-based communities to sustainably manage and market value-added NTFPs as sustainable alternatives to economic activities that damage the forest. For the past six years, we have been studying the ecology, management and market potential of resins and other aromatic rainforest plants and worked with native and campesino communities to develop innovative designs and markets for plant-based handicrafts. We return part of the proceeds from our sale of crafts to our partner communities to support their basic needs in health, education and conservation. Our work with native communities in the Ampiyacu River region of the northern Peruvian Amazon has been funded so far with grants from the Marjorie Grant Whiting Center, the Rufford Small Grant Foundation and donations from CACE supporters. We are participating in the Open Challenge of the Global Giving Foundation to expand our base of support for this project. We can earn a permanent spot on this grassroots funding platform by raising at least $5000 from at least 40 unique donors by December 31. Global Giving awards bonuses of $300 to $3000 for groups that exceed these minimum goals in various ways. Please visit Grow Amazon Artisan Income & Peru Rainforest Trees on Global Giving to view or donate to this project. See full CACE Ampiyacu Project Description. See a summary of project goals and activities below. This project will enhance forest conservation in the Peruvian Amazon by promoting the sustainable harvest and marketing of value-added non-timber forest products (NTFPs) by indigenous communities near the 433,000 ha (1.07 million acre) Ampiyacu-Apayacu Regional Conservation Area. Our project team will work with five Bora, Huitoto, Ocaina and Yagua native communities in this high biodiversity region to: 1) survey and sustainably harvest wild plants used for making value-added products, 2) promote the planting of trees that yield important non-timber products, 3) produce essential oils from aromatic plants, 4) create innovative high-quality handicrafts from local plants with traditional weaving techniques, and 5) build artisan and community capacity to market these products as alternatives to economic activities that damage natural forests. In addition to working directly with artisan associations in the focal villages, the project will closely cooperate with the Federation of Native Communities of the Ampiyacu (FECONA), Camino Verde, the Instituto del Bien Comun, and other Peruvian institutions. This project will catalyse forest conservation and community development in the 433,000 hectare Ampiyacu-Apayacu Regional Conservation Area in northern Peru by empowering native communities to sustainably harvest and market value-added non-timber forest products including essential oils and innovative fair-trade handicrafts as an alternative to destructive logging and cash-crop agriculture. This strategy treats rich biodiversity and traditions as assets to improve livelihoods so communities will have tangible incentives to safeguard the area’s 1,500 plant and 700 vertebrate species. The project will focus its efforts in five of the fourteen native communities in the region: Brillo Nuevo (Bora), and Nueva Esperanza (Ocaina) along the Yaguasyacu River and Puca Urquillo Bora, Puca Urquillo Huitoto, and San José de Piri (Yagua) along the Ampiyacu River. 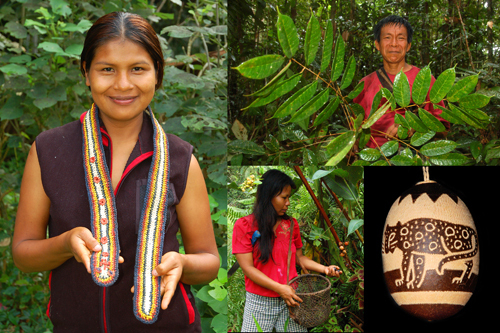 This project will help build the capacity of native communities to assess the abundance, sustainable harvest and economic potential of copal and aromatic trees by combining their natural curiosity and traditional knowledge of forest plants and wildlife with new forest inventory and technical skills. It will work with native woodsmen to sustainably harvest parts of aromatic plants and distill them into fragrant essential oils. Marketing these oils would be one new way to generate income without imposing severe impact on the forest. The pilot phase of these activities is based in the Bora native community of Brillo Nuevo on the Yaguasyacu River. 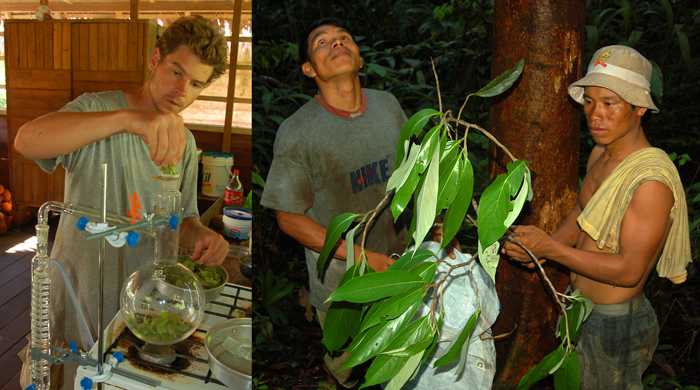 The CACE Project Manager, Local Project Coordinator, and a rotating team of native woodsmen will map the location of copal, moena and other aromatic trees and plants, collect samples of resin and leaves, and distil them to assess the quantity and quality of the essential oil extracted from them. This information also will be used to devise a management plan with the native communities and help the provincial government establish sustainable harvest guidelines for similar enterprises in the region. CACE is collaborating with Camino Verde, an NGO based in southern Peru, to plant 1000 rosewood tree seedlings (now being raised at a nursery in Jenaro Herrera on the Ucayali River) in Brillo Nuevo in secondary forest plots (“purmas”) of five families. This reforestation project will have long-term benefits since residents will be able to begin harvesting leaves from these trees in three to four years and distil them into a fragrant and marketable essential oil. The offspring of these trees will then be shared with other community members to plant in their fields. By the end of this phase of the project, a cadre of woodmen will know how to use basic forestry equipment (GPS, compass, climbing spikes, pole pruner, and hand pruner) to conduct a basic survey of forest resources, preserve specimens for identification, and sustainably harvest resin and leaves from forest trees. Essential oil samples will be chemically analysed and examined by fragrance company specialists to assess their commercial potential. The handicraft component of this project will work with artisans from all five community partners in the project. Encouraging these artisans who are mostly women to develop new woven products incorporating snake patterns and native motifs has already begun to transform craft making in Brillo Nuevo village from an individual pursuit to a more collective endeavour. The process is infused with creativity, skill sharing, cultural richness, ecological concern, and pride that craft sales can help fund immediate community needs. We are seeking to strengthen newer relationships with Bora and Huitoto artisans from the twin-village of Puca Urquillo, Ocaina artisans from Nueva Esperanza, and Yagua artisans from San José de Piri. We have had preliminary meetings with the Yagua community of Santa Lucia de Pro to become part of this project in 2013. CACE works closely with our partner artisans to develop new products and models of handicrafts. We began by buying and trying to sell some of the crafts they were already making. Customers who liked these often suggested ideas for ways to improve these or make whole new products. We now aim to develop signature products or models with each partner community. In Brillo Nuevo, where we have been working the longest, artisans are refining designs for belts, net bags and hot pads (trivets), dog collars and leashes, and guitar straps woven with chambira palm fiber. See the special brochure about the Amazon Guitar Strap for the full story on this unique product for musicians. We are working with weavers in Nueva Esperanza to develop a line of coin purses and cell phone carriers. 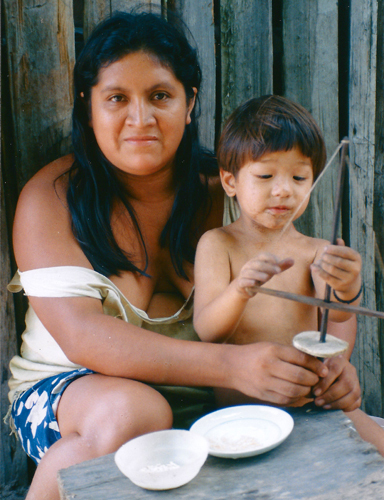 In San José de Piri, Yagua women are making samples of a doll-sized woven hammock. Artisans from Puca Urquillo have made great progress developing diverse models of Christmas tree ornaments that double as hand rattles. Most are made from small calabash fruit pods – some are etched with wildlife figures, others are covered with colored chambira fber. The newest models are woven miniature jungle animals like armadillos. Our Project Manager visits our partner communities every month to place orders for the crafts. The village associations then divide these orders among their members according to their particular talents and enthusiasm. We encourage artisans to share their skills with each other informally and organize larger skill-sharing workshops within and between villages so the most accomplished artisans can demonstrate their techniques for making new and complicated products to their peers. When an artisan finishes a craft, the project manager inspects the item and gives the artisan detailed feedback on how to improve it if necessary. We are also encouraging each association to form its own quality committee so the artisans can approach a peer mentor for help and move toward full responsibility for the quality of crafts offered for sale. Most handicrafts made in the Ampiyacu region (and northern Peruvian Amazon) are woven from fibers of the chambira palm tree. 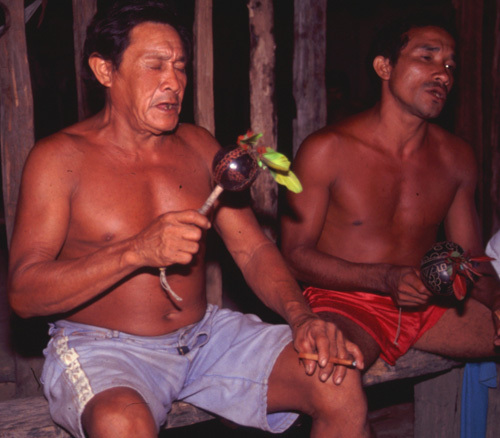 Artisans harvest a spear of young leaves (a “cogollo”) from a palm that has grown naturally in one of their fallow agricultural fields (“purmas”) that is reverting to forest. There always used to be enough chambira for artisans to harvest in a casual way when the demand for crafts from these remote villages was low. As the demand for handicrafts grows, however, the communities need to harvest chambira with greater care and increase its abundance. The CACE project will help the communities create a sustainable supply of chambira palm for craft making in several ways: 1) we are providing each pair of artisans (usually a mother and daughter or two sisters) a slender pruning saw to harvest a chambira “cogollo”. This will allow them to remove a spear without damaging the healthy leaves next to it that frequently occurs when harvesting chambira with a machete; 2) we are working with artisans to measure chambira abundance in their “purmas.” Results will show how many crafts they can make from their current stock; 3) we will support the creation of nurseries to grow chambira palm seedlings that can be transplanted into artisan “purmas”; 4) we will encourage artisans to leave some chambira trees unharvested so each plot will have at least one large tree to provide abundant seedlings and natural regeneration in the future. Native artisans from the Ampiyacu region have always had the opportunity to sell their crafts to shops that cater to tourists in the city of Iquitos. The reason this option has not been very attractive for most is that getting to the city is a long and costly trip for them, and the tourist markets are glutted with low-priced bags, hammocks, and jewellery made by hundreds of artisans. The CACE Handicraft project offers our partner native artisans a chance to sell their unique crafts to more lucrative markets in the U.S. and other countries. This effort will best succeed if potential customers feel connected to a craft and the people, plants and places that went into making it. We want them to understand how their purchase can help put an artisan’s child through school, build a pharmacy for the community, and bring back a species of tree that was almost wiped out. We will work closely with the artisans to record their accomplishments, challenges and dreams for themselves, their family, and community. These rich stories will be presented in long and short forms on handicraft tags, product brochures, the CACE blog, newsletter, website and the upcoming online Amazon Forest Store. To supplement photos taken by the Project Leader and Project Manager, we will train the Local Coordinator to use a camera and video to help document these processes during this project and beyond. This project’s ultimate goal is not to make new products; it is to help forest-based communities realize that cultivating their imagination and cultural traditions, intimate knowledge of nature, and entrepreneurial skills can improve their standard of living without destroying their forest or relying on charity. A “Fair Trade” product usually means the item was made by people paid a fair price for their labor in decent working conditions. A “green” star is sometimes added onto this to this label to indicate the product was made with minimal negative environmental impact. CACE aims to surpass these criteria by adding a third component to the social contract with our partner communities. We set aside 20% of the proceeds from crafts we sell made by artisans from their community into a “Social Rebate” fund. These funds are then used to support health, education or conservation needs in that community. With small communities like the native villages in the Ampiyacu region, CACE informs the whole community how much is in their account and then leaves it to this general assembly to decide how these funds will be used. In towns such as Jenaro Herrera, CACE consults with the head of the public health clinic and principal of the public school to use available craft rebate funds to support the most pressing local needs for health and education. In the case of Brillo Nuevo, rebate funds have so far been used to buy some pruning saws for careful chambira palm harvest, and to buy medicines and materials to build a public pharmacy that is nearing completion. See full CACE Ampiyacu Project Description. Greetings friends. Our Center for Amazon Community Ecology project to create sustainable livelihoods for native communities & promote forest conservation in Peru is now “live” with the Global Giving at http://goto.gg/12229. We need to raise at least $5,000 from at least 40 people between November 26 and December 31 to become a permanent member of the Global Giving network. Please support us with a donation if you can and SHARE the project page on Facebook. The group that gets the most Shares on Facebook during this Open Challenge from November 26 through Dec. 31 gets a $300 bonus. Every donation counts!!! Donations can also be made the project by check. Make it out to: The Global Giving Foundation. Write Project 12229 and your email address in the Memo line on the bottom left of the check. This is very important to make sure your donation reaches us. Send to: The Global Giving Foundation, 1023 15th Street NW, 12th Floor, Washington, DC 20005. Checks should arrive by Dec. 28. Thank you very much for your support. If you have questions, please contact us through the CACE website. 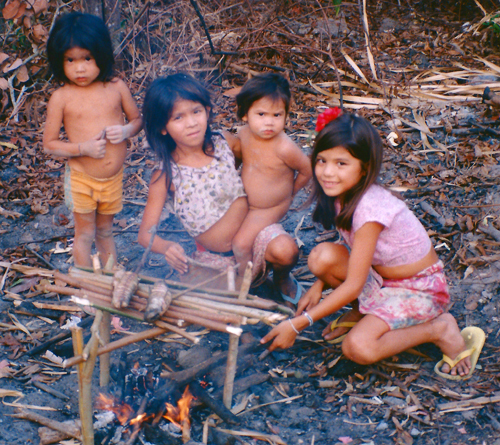 Beginning in the fall of 1997, my wife, 7 year old daughter, 2 year old son, and I lived for a year with the Tembé Indians in the eastern Brazilian Amazon while I did field work for my PhD in Ecology. 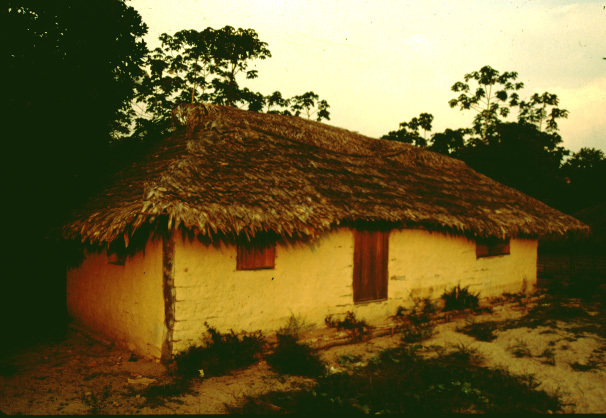 Our home in the village of Tekohaw was a three room mud wall house with a palm thatch roof. We slept side-by-side in hammocks, used an outhouse in the back yard, cooked over a two-burner gas stove, bathed in the Gurupi River, and traded surplus packaged food from the city for fresh fish, fruit and game meat brought to us by our neighbors. The simple living was a good challenge for our family used to basic American comforts, but after three months of washing clothes by hand, hearing everyone speak a strange language, and pleading for field assistants to start the research, Yuri, Marissa and I were all ready for a Thanksgiving break in the city. Young Luke was happy as long as Mom was nearby. Since we were going to have a big dinner with some fellow researchers, I thought it would be appropriate to bring along a bird from our Tembé hosts. Our friend Emidio kindly complied with my request and killed a “jacu” (white crested guan) for us to bring to the city. My Brazilian colleagues appreciated my story about the origin of Thanksgiving and our bird from the Tembé hunter, but I have to admit that the freshly cooked turkey and apple pie tasted a lot better than the funky “jacu” hadn’t made the long journey from the forest in prime condition in spite of being smoked. A year later, my family was back in Pennsylvania while I prepared to spend Thanksgiving in Tekohaw. My research was really in full swing by then so I decided to use the occasion to thank my Tembé research colleagues and a few close neighbors with the best dinner I could put together with my limited supply of prime fare. My first sign of warning should have been the tingling of my instinct when I invited the guests out of earshot of others. Having discreetly made the invitations, I returned to the house and started cooking and preparing the house. While setting the biggest table with a tablecloth (a dirty sheet) and candles, I heard someone come in the house. Maku, a deaf mute Ka’apor indian who seemed to have ESP regarding unusual events in my house, walked in, took one look at the spread and walked out without making any attempt to communicate with me. Eventually the invited guests and a few other uninvited ones came in and took a seat at the table or bench on the periphery. I gave my spiel about how special it was to be celebrating Thanksgiving with them since most Americans have long ago forgotten about the Native American connection to the holiday and served the meal. While the guests clearly enjoyed the food, they spoke little, thanked me and left shortly after all plates were empty. I didn’t know what he was really thinking, but I wondered if Lourival, the village headman, felt particularly awkward being at a gathering to which all had not been invited. To say the least, the evening did not resemble my fantasy of recreating the jovial atmosphere of Thanksgiving dinners at home. Several weeks later I was due to celebrate my 45th birthday. Intent on not repeating the Thanksgiving experience, I enlisted the help of my friend Lourdinha to do a Tembé style celebration. I didn’t have much food left on my shelf, but I gave her almost all that I had left to prepare for the feast. I went around to all 25 houses in the village and invited one and all to the village meeting house. At the appointed hour, the open-air structure was full of folks from the village and many visitors who had arrived to help celebrate a one-day festival in honor of Saint Luzia. The headwoman Veronica ladled out the offerings of watery oatmeal, coffee and hot chocolate one third of a cup at a time to a throng of kids jostling in front of the serving table illuminated only by two small kerosene lanterns. Within half an hour, the oatmeal, beverages and three cans of goiabada (guava jelly) were gone. While I wished I’d had twice as much food to serve, I believe everyone had a good time. My wonderful present was sharing a little of my bounty with a hundred fine folks and joining in on the chorus of a traditional Tembe chant being vigorously belted out by two men. The next day I did share a small cake in the forest with my research crew who sang me a Brazilian rendition of Happy Birthday. 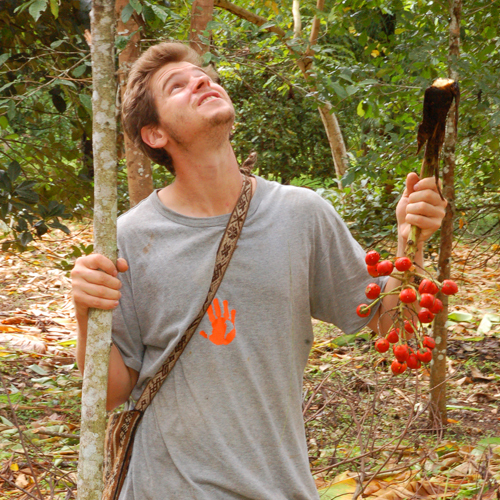 The Center for Amazon Community Ecology is pleased to welcome Robin van Loon as the newest member of the CACE Advisory Board. Robin is the founder and executive director of Camino Verde, a non-profit organization dedicated to planting trees in the Peruvian Amazon. He is a native of Massachusetts who has lived in Peru since 2001 studying traditional use of medicinal and economic plants in the Andean highlands and lowland tropical forest in Madre de Dios. Three years after moving to the Tambopata River area, he founded Camino Verde in 2007 to launch the first viable reforestation projects in the region. The organization created and manages a “Living Seed Bank” that features ten thousand trees representing 250 species valuable for fruits, medicines, craft-making materials and timber. Camino Verde also makes tree seedlings available to local farmers as an alternative to slash-and-burn farming. 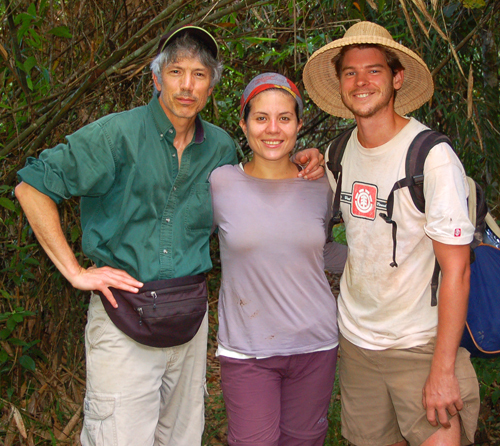 Officers of the Marjorie Grant Whiting Center for Humanity Arts and the Environment (MGWC) introduced Robin and CACE Executive Director Campbell Plowden to each other in 2010 to see if they could combine their distinct experience and methods to enhance forest conservation and support sustainable livelihoods in the northern and southern ends of the Peruvian Amazon. 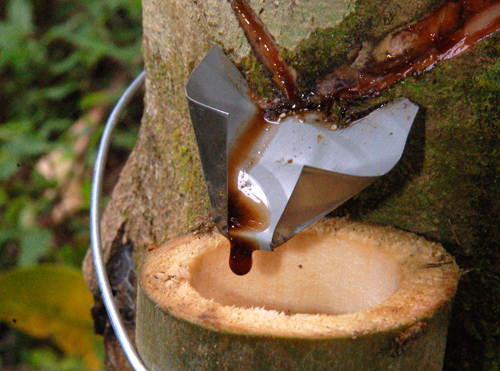 1)	CACE is helping Camino Verde to develop a scientifically based study of the sustainable harvest of medicinal latex from several hundred sangre de grado (“dragon’s blood”) trees planted at Baltimori in the Tambopata River region. 2)	Camino Verde is the technical advisor and co-financer of a project to plant 1000 rosewood tree seedlings in secondary forest fields in the Bora native community of Brillo Nuevo on the Ampiyacu River. When the trees mature, CACE will work with the community to distill the leaves into a marketable fragrant essential oil. 3)	CACE and Camino Verde are conducting trial distillations of leaves and branches from several sister species of “moena” trees to develop novel essential oils from Amazon rosewood relatives (family Lauraceae). Promising products will be developed for sale to fragrance companies to generate income for forest communities. Both groups seek ongoing support for these initiatives. Donations may be sent to support them through the online non-profit funding platform Global Giving. The CACE campaign – Project # 12229 will “go live” on November 26.